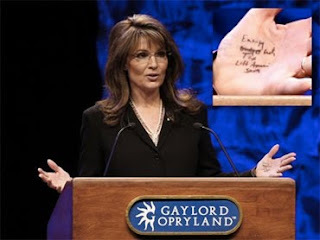 Yesterday I commented on Sarah Palin's appearance at the Tea Party Convention and wondered aloud what she had written on her hand. Now we know. Kind of gives you a warm fuzzy knowing that a large number of American's actually think this woman is qualified to run the country.